As an online marketer, you usually feel unappreciated since you tend to deliver results that are not meeting your manager's expectations. Setting objectives and KPIs for your online marketing campaign require first a complete understanding of the difference between objectives and KPIs in digital marketing. So what is exactly the differences between objectives and KPIs? First, let’s have a clear definition of the terms objectives and KPIs. 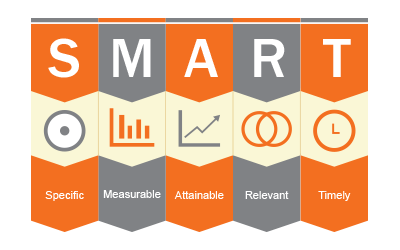 Objectives, according to Smart Insights, is defined as the target that needs to be reached to measure and track the performance of your digital marketing efforts. This is done relevant to your overall marketing and business goals. Setting objectives are essential to be set for any team leader or manager. Specific: you can’t set an objective that is not clear, you have to specify what exactly needs to be done to reach your target. Don't leave it vague. Measurable: Make sure you can track your efforts, numbers always play the role here. Don't go saying increasing brand awareness and that's it. That isn't measurable. Attainable: Don't go like I need our website to be ranked on the first page in one month! Well, come on HOW? Make sure you set objectives that can be achieved within the time set. Relevant: Put an objective that is challenging but can be achieved related to the overall objectives of the business. Timely: set deadlines, don't leave to "whenever, whatever". Here are some examples of poorly written objectives. I want to increase website visitors. I want to increase brand awareness. I want to rank number one in Google. It's easy to set objectives this way, but when you get to action, things get harder. If I got you 1000 more website visitors, will this be enough? How much website visitors do you exactly need? Your objectives need to be more specific so that you can work on them and track them too. Let's see how well defined SMART objectives look like. So how is this SMART? Relevant: objectives set according to overall business objectives. Now, you've set your SMART objectives taking into consideration all the points we've discussed earlier. So, what's next? It's time to outline certain KPI's (Key Performance Indicators) that act as a compass to your journey of achievements. KPIs are defined as quantifiable measurements that measure the progress of your marketing efforts in reaching your business objectives. You should clearly understand which KPIs are reasonable for the objectives you've set. What key points are your source of indicators to a successful progress? KPIs are not only set to track your progress but also to improve your marketing efforts, what went wrong? I've achieved less than expected, what is needed to enhance the performance. When setting KPIs they should be chosen related to your objective for a successful execution of your marketing campaign. Without choosing the right KPIs, your digital marketing company or marketing department will be reporting and making decisions based on misleading information. Below, are some examples of KPIs you need to track for various marketing efforts. you wanted to increase the engagement on your website, but what are the indicators you need to set to check if your efforts are increasing the engagement on the website. Number of unique website visitors: how many new visitors have been to your website? Return Visits to the website: Do the visitors come back to your website?This would be a sign of having valuable content on your website that makes them come back for more. Time on the website: how long does a visitor stay on the website? the longer the time the more valuable content the visitor appears to enjoy. you need to understand where does your traffic come from. Are they coming from referrals, social media, organic or from search? The number of visitors coming from each source will be a great indication of where your target audience are and where you should focus more. KPIs include direct traffic, referral traffic, traffic from search, organic traffic, social media and paid traffic from advertising. Don't go choose over 20 KPIs to ensure you're on the right track. Less is always better, choose from 4 to 10 KPIs to focus on. Online marketing KPI help you have a solid understanding of your marketing efforts. By the end of the month or quarter, you want to hand this report with numbers that prove you have achieved the objectives set in coordination with your manager. Without tracking your marketing efforts, you won’t take a step forward. Objectives and KPIs are a set part of your online marketing strategy, download the FREE template for a marketing strategy that will help you build a digital marketing strategy for your next campaign.